A Mummy can be any living being that has been preserved at death through the egyption technique of embalming. Once the Egyptians removed the bodies organs, they would steep it in Natron, which is a whitish or yellow mineral that consists of hydrated sodium carbonate that occurs in salt lakes and leave it there for about seventy days before washing the corpse, and wrapping the whole body in flaxen cloth and covering it with tree gum. Some Egyptians did not think the brain served any purpose they believed your thoughts and functions came from the heart. Click Here To Continue Touring The Museum. Never Disturb A Mummy's Tomb! When a mummy's resting place is disturbed it brings the spirit of the embalmed mortal back to life. 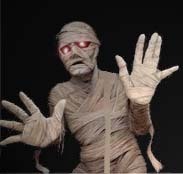 Once a Mummy is brought back to life, they become part of the living dead.